Equipped with 1080P HD camera , H906A advanced edition controller . Function: GPS ,headless mode ,automatic return ,altitude mode ,follow me . Hubsan FPV controller real time 5.8GHz transmitter and 2.4GHz receiver . 6 Axis Gyro latest 6 axis fly control system ,make it fly more smoothly . When you buy the Hubsan H501S X4 Pro you don’t just buy a quadcopter you buy fun! This package is complete and just add propellers, charge up batteries and you are ready to fly. FAA Registration required: Yes. Any craft over .55 lbs (249.5 g) must be registered. Easy to use follow-me makes this quadcopter a great product to take on your vacation. Complete – includes everything that you need. No need to setup a smart phone to use as your viewer. The feature set chosen by Hubsan H501S X4 Pro includes most of the features that you will want. Hubsan has chosen to build the viewer into ground control station. This gives you excellent response and an easier setup. Hubsan has included both automatic and one-button RTH (Return to Home). Ground controller uses a LiPO rechargeable battery. Ground controller uses an AA battery. The Hubsan H501S X4 Pro is almost exactly the same as the Hubsan H501S X4 standard. The only difference is in the Ground controller. The Standard comes with a ground controller which uses AA batteries, the Pro ground controller uses a LiPO rechargeable battery. The cost of the more expensive LiPO battery is more than offset by the saving from not having to replace the AA batteries in the standard edition. Battery 7.4 v 2300mAh Lipo 105g Gives you about 20 minutes of flight time. Camera is FPV. But with headless mode, you can fly the quadcopter sideways and get the same views as you would get with a gimbal mounted camera. 6 axis stabilization means that you can produce a video with less jerky motions and sudden movements. Follow-me mode is used to produce a video showing you and what you are doing. This is great for vacation videos. Headless mode is used to take videos sideways to the line of flight. Built in GPS assists in hovering and and the Return to Home functions. Auto Return to home means that when the quadcopter gets to be to far away from the ground station (low signal), the quadcopter will automatically return to the take-off point. One button RTH (Return to Home). If you see it going to far or something going wrong, just push RTH, and it will fly back to “take-off point”. Follow-me mode is great on vacations. You can show what you are doing and where you are. Altitude hold gives the ability to stop the quadcopter, but not land it and continue recording a video from a fixed position. 4 channel transmitter allows the pilot to control multiple quadcopter functions at the same time. For example, changing altitude at the same time that you make a turn. Li-po battery is rechargeable, saving money not using AA batteries. Headless mode allows you to fly sideways and get a video to the left or right of the line of flight. Overall this Hubsan H501S X4 Professional quadcopter is very nearly ideal. This quadcopter does everything that most intermediate drone pilot want and for a very nice price. 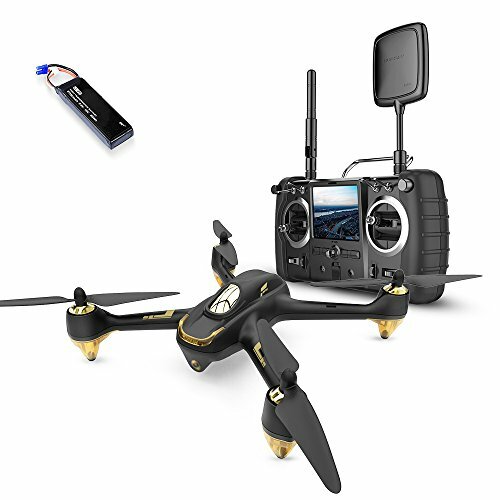 This Hubsan H501S X4 Professional version drone (View on Amazon)has a great price point for a quadcopter with HD camera, follow me feature and Headless mode. Return to Home feature, automatic and manual, will be a great help in keeping you from losing your expensive quadcopter. LiPO batteries in the quadcopter and ground control are rechargeable and will save money on batteries. Note: Software update required before flight? Updates come out when problems are identified. You should check before you fly the first time and again every few months. Check out our review series on camera drones.